Last year’s annual Dunstable Downs Kite Festival was the best attended on record. That is until now. The Dunstable Downs Kite Festival 2014 was a weekend of hot summer sun, cool gentle breezes and kites, kites, kites! The festival has the special mixture of wonderful displays of colour, shapes and sounds for the public and at the same time, relaxed and chilled for the kiters. From the moment you arrive to the minute you finally drag yourself away you feel well looked after by the staff and volunteers from the National Trust. Hosted and run by the NT team from the Chilterns Gateway Centre with kite support and liaison from Joe Brown and our very own Susan and Stephen Hoath, this symbiotic relationship works very well with the end results speaking for themselves. For the invited fliers this is a dream location. The arena is huge with short freshly mown grass overlooking a spectacular view. The hard working team from the NT have everything ready for the fliers when they start arriving on Friday. The arena is set, the PA ready and the small camping area ready to go. In fact, the only thing we have to worry about is choosing which kite to fly first! This year’s event was the biggest yet with fliers from across the UK, Germany, Holland and France in attendance. We had a wonderful display of banners this year at the event with a wall of silver banners from Carl Robertshaw and the intricate bird banners from Gill Bloom. The ever changing display of single line kites was lead by team Kiter-on-Tour and Frank Hagedorn and family from Germany. Between them they provided a wonderful array of giant inflatable kites flying in the skies above the Downs. We were delighted to see so many fliers from the UK clubs with us this weekend with some beautiful kites from The Great Ouse Kiteflyers, The Kent Kite Flyers and the Loddon Valley Kite Flyers. Sport Kite flyers were very much in attendance too. Team Spectrum put on their usual excellent display, these guys are some of the hardest working fliers on the circuit with ballets well designed to please the crowds. Other dual line displays came from the new guys Flying Fish and the beautiful tails routines from The Air Heads. Each team has their own unique style that was shown to great effect this weekend. As well as the dual line fliers, quad kite displays were provided by the local team The Flying Squad. 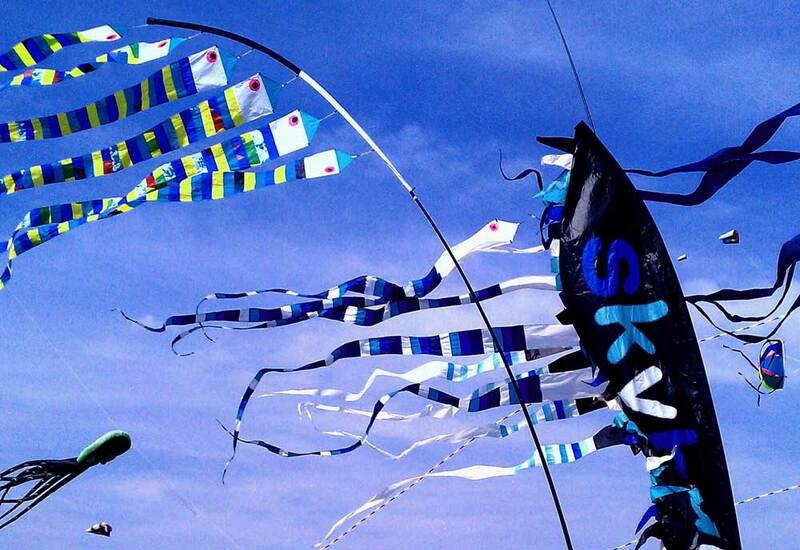 The Dunstable Downs Kite Festival is our local event and we are proud to be involved. We would like to say a huge thank you to Joe, John, Paul and their teams for making this not only a wonderful event to watch but great fun to be involved with.